GH - Is your Twitter Card not working? Is your Twitter Card not working? Which one do you find more engaging? 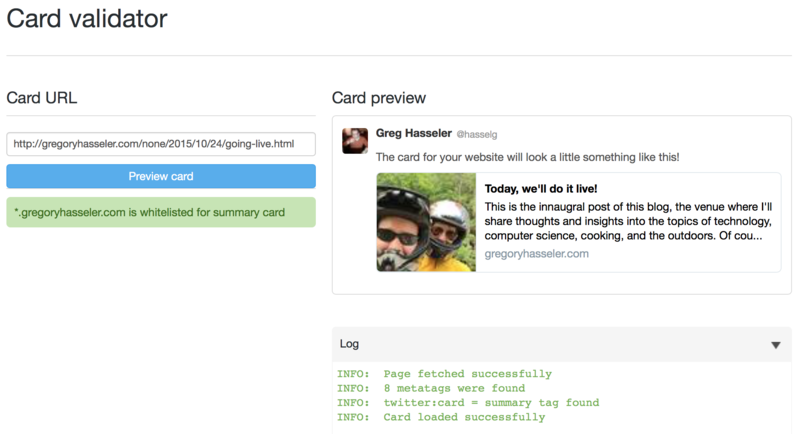 Making your site work with Twitter Cards is actually very straight-forward. The process is even very well documented in Twitter’s documentation. For the basic type of cards I’m interested, the “Summary Card” and “Summary Card with Large Image”, the high-level overview is essentially just adding 4 - 6 meta tags into the head of your page. Results from the Twitter Cards Validator. Unfortunately, sometimes things don’t validate and it isn’t clear why. Other times, they validate but don’t work! Such was what happened to me. The validator would show no errors, but the thumbnail for the summary card would just not show. Twitter has a helpful Troubleshooting Guide, but none of the things they suggested seemed to work. The closest I could find was that maybe I had a robots.txt that was denying Twitter’s Twitterbot. However, at this early time of development, I didn’t even have a robots.txt, so that couldn’t possibly be the case! But then I decided to look at my web server’s access log, just out of desperation. What are all of these 404 errors about? "GET /robots.txt HTTP/1.1" 404 151 "-" "Twitterbot/1.0"
Is it possible that the Twitterbot is actually ultraconservative and won’t crawl your site if robots.txt is missing? "GET /robots.txt HTTP/1.1" 200 34 "-" "Twitterbot/1.0"
…and now Twitter Cards work! If you’re trying to get Twitter Cards working on your website, make sure Twitterbot can access a sufficiently permissive robots.txt on your site. If it can’t, your site may pass through the Cards Validator but still not actually work!